I can see so many possibilities with this lovely new pattern set by September House; a set of seamless designs so you can create your own embroidered fabric, as big or as small as you want. I can imagine some people picking and choosing just one of the motifs as a discrete accent on say a pillow case and others using the patterns to embroider a whole cushion cover, the possibilities are pretty endless. For me personally (I could not resist purchasing this pattern set), I plan to embroider some patchwork squares with both designs, to use in an Autumnal patchwork bag. I love paisley! This pattern is beautiful, it will have to go on my to-do list. I just redid our bedroom in paisley, so this is perfectly timed! Love it!! These patterns are lovely! I particularly like the colours you've used for the one on the right. Gorgeous designs. I love the paisley one. It's make a lovely clutch bag or cushion... something to gaze at. Loving those so much - especially the paisley one!!! outstanding work god job! 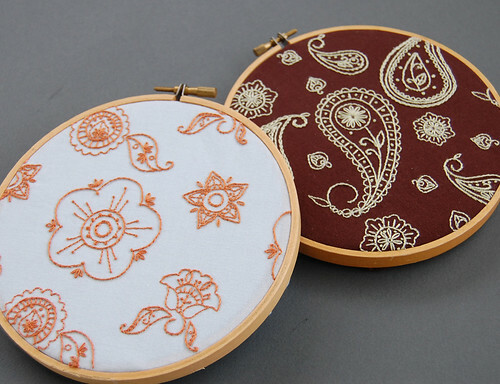 Embroidery does not stop with garments.Embroidery designs is a easy task but it needs a lot of fulfillment and sticking with to get one more impact.